Tomorrow I probably have to rethink my way to work. 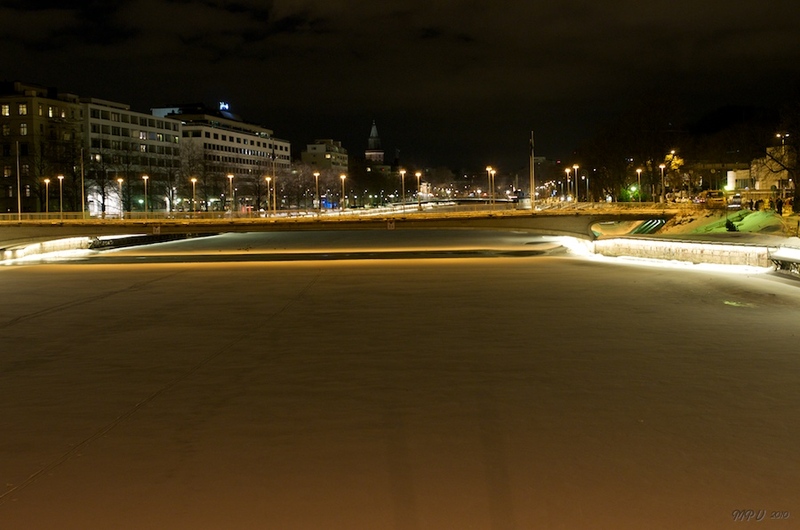 Before yesterday Turku had 5 bridges for crossing river Aura by car. Yesterday morning one of the bridges, Myllysilta, started to fall down. Here is a picture of the bridge taken earlier. The bridge was built in 1975 and it developed many problems for the city in the very beginning. It was praised as the the most beautiful and the cheapest bridge ever built but the arch like structure was not as strong as it should have been. The engineers had made a mistake in the calculations and the bridge fell some centimetres before it was even taken in use. The bridge was finally repaired in 1987 by Turku with 4 million Finnish marks. Yesterday morning someone noticed that the bridge had fallen and it was taken off use. In the morning it had fallen 15 cm but by the end of the day the middle of the bridge was 94 cm lower than originally. Here is a short video of my walk near the bridge about noon. I could not get any closer because of the police tapes. Here is the situation in the evening. The picture is taken by my friend mvallius. Now it is not certain if the bridge will collapse or not. It probably has to be rebuilt and it takes more than a year before the new one can be taken in use. Meanwhile, the other one-way bridge nearby has to be converted to two-way traffic. A chaos will be expected anyway. I do not use the bridge in question very often, but the traffic will be transferred to the one I use. I think I will start driving the motorway instead of the shortest option. Has Turku bridge gone down yet? Hi Leena. I recently read your blog. Good Job! Our website's goal is to help students from k-4th grade learn math. We do this by offering free math games. We would like to be added in the sidebar of your blog. This would help more teachers to teach their students math. Below is the exact code that needs to be copied and pasted into your sidebar. site. If interested in the offer please include in your reply the desired keywords to be searched and reported on. Thank you so much Michael. I look forward to your reply. Hi there, just passing through. I saw that you followed a blog about kids toys and just thought I would let you know about a fun Melissa & Doug giveaway over on my blog. I have noticed the chaos in the citycentre, it seems to be packed with cars every time I have to drive through the centre. I really never liked driving there, but it is even worse now.